1: What is the name of the school they attend? 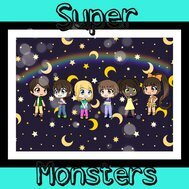 2: How many Super Monsters are there? 3: What is Kayta's cat's name? 4: How many seasons are there? 5: How are the two caregivers related?